Lunar Eclipse 2018: Witness rare Super Blue Blood Moon today. 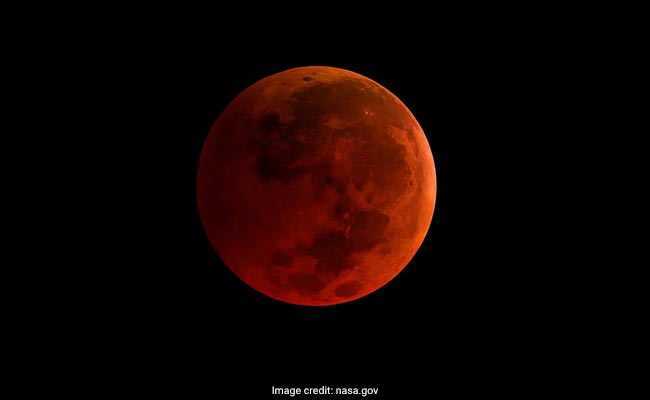 A rare celestial phenomenon will occur today as blue moon, supermoon and blood moon coincide on a total lunar eclipse day, also called "Chandra Grahan". Today will be the first lunar eclipse of the year and will be second full moon in the month. This is called "Blue Moon". In addition, the moon will appear crimson in colour. During total lunar eclipse, when the moon gets shadowed by earth, the sunlight passes through the earth's atmosphere and breaks down. The red part of the sunlight gets least refracted, giving moon the tinge of orangish red. This is called "Blood Moon". Further, when the eclipse happens, the moon will be close to earth by 60,000 km against the average distance between the moon and the earth. It will appear brighter and bigger. This is called "supermoon". The rare spectacle today has been coined as "Super Blue Blood Moon" by NASA as "supermoon", "Blood Moon" and "Blue Moon" will coincide on a total lunar eclipse day. This phenomenon will be visible in large parts of the US, north-eastern Europe, Russia, Asia, the Indian Ocean, the Pacific, and Australia. The rare lunar eclipse will appear for the first time in over 150 years. The lunar eclipse is a phenomenon that occurs when the Earth, moon and sun are in perfect alignment, blanketing the moon in the Earth's shadow, says NASA. It is called chandra grahan in Hindi. In total lunar eclipse, the direct sunlight is completely blocked by the earth's shadow. 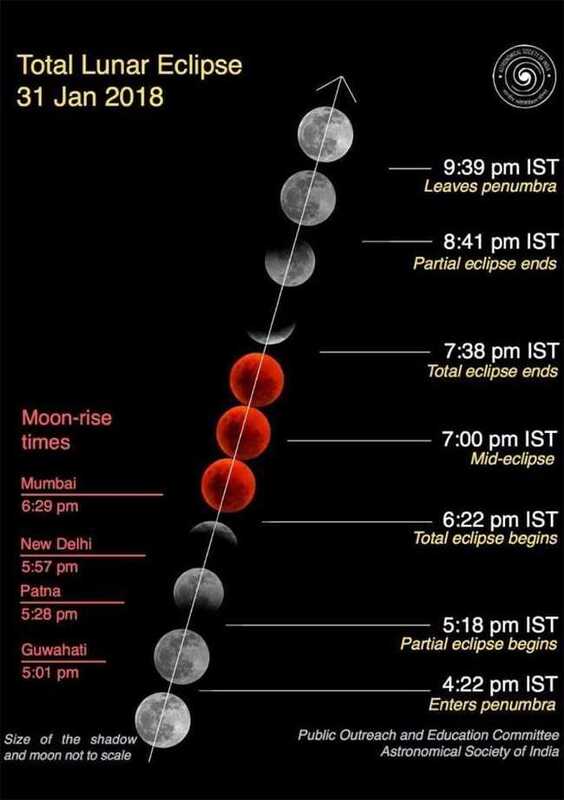 What are timings of lunar eclipse in India? In India, the eclipse will commence at 5:18 pm. The duration of the total lunar eclipse will be 76 minutes and it would start at 6.21 pm today and will be visible till 7.37 pm. The partial eclipse will end at 8:41 pm. The duration of the total eclipse will be 1 hour 16 minutes. Lunar Eclipse 2018: Key timings you should know. What lunar eclipse means? An explanation. Hyderabad's BM Birla Science Centre said "A slight sliver of the moon first gets covered in what is called the umbra, the total shadow, and slowly this spreads for several minutes. After that, it will recede and in an hour's time, the main part of the eclipse would be over." Due to "Supermoon", "there may be slightly higher tides in rivers and seas that day but nothing very alarming," the release by the centre added. "Super Blue Blood Moon" is a rare phenomenon and must not be missed. When will be the next lunar eclipse? After today, the total lunar eclipses will be on December 31, 2028, and, after that, on January 31, 2037. Don't forget to witness the rare "Super Blue Blood Moon" today!